Igor Sikorsky, the brilliant aviation designer and founder of Sikorsky Aircraft Corporation, was born on this day in 1889. Originally from Kiev, he emigrated to the United States in 1919. He set the standard for helicopers in 1942 with the XR-4, the world's first mass-production single-rotor helicopter. 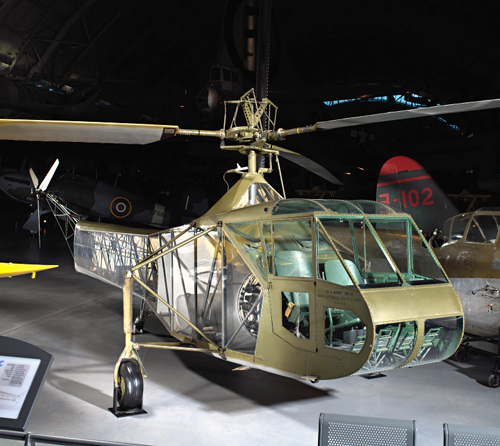 The XR-4 helicopter pictured above was used by the Army Air Corps in World War II and is now in the collection of the Smithsonian National Air and Space Museum. The Washington, D.C. museum has a fine collection of Sikorsky aircraft, as well as myriad other avation and space objects, and some are represented in their online image gallery.